We’re excited to announce we’re now offering our award-winning, 100% ENERGY STAR® certified homes in the Gran Lake community, which is located in St Johns County. 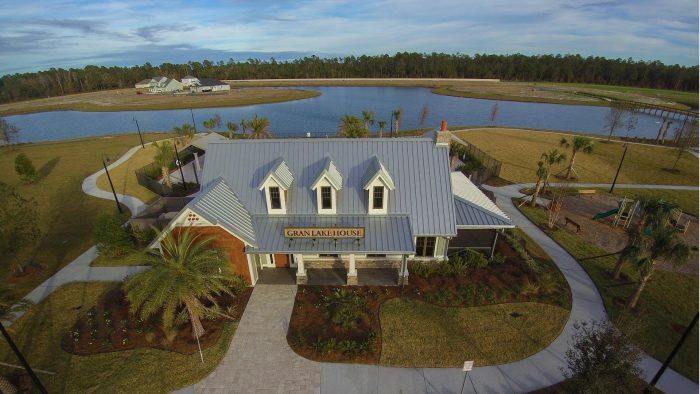 In case you haven’t had a chance to check it out yet, Gran Lake is a beautiful, master-planned community located near World Golf Village and I-95. It offers easy access to both Jacksonville and St. Augustine and is only a half-mile from the brand new Picolata Crossing Elementary School. If you’re looking for a community in St. Johns County without CDD fees, Gran Lake is a great option for you. With a stunning amenity center, public dock for canoeing and kayaking, playgrounds, walking trails and much more – Gran Lake is a perfect place for your family! The Gran Lake community allows you to enjoy the amenities of a large community without the foot traffic. “The developer took years of experience and comments from homeowners when designing the layout for this community.”, says Andrea Brown, Sales Associate—Providence Realty, LLC at Gran Lake. “Of the 165 current homesites, only 21 have a full or partial backing to another lot. The remainder is either our beautiful large 36+ acre lake or trees. And unlike most communities that have rules against using the lake, we say go for it! Paddle board, kayak, canoe, sail, fish… go for it! Or if swimming is more your style, enjoy the sloped entry pool – perfect for all ages.” In addition to being centrally located between Jacksonville and St. Augustine, Gran Lake is just two miles from the Shoppes at Murabella featuring restaurants, shopping and convenient grocery options; and is just 15 minutes from the St. Augustine Premium Outlets. Plus, the brand new Picolata Crossing Elementary School is located across the street from where Phase 2 will be built. The school adds to the beauty of the community and young families can enjoy this great school within walking distance from their homes. Gran Lake homes start in the $270s and feature 10 floor plans ranging from 1,982 – 3,511 sq. ft. to compliment your lifestyle. Visit the new Ellaville Model Home, open daily!